And even if it did lead you to Christianity, it may not lead you to the Right Kind of Christianity. If god gives us a Sensus Divinitatis, why did he give the vast majority of people an unreliable one? Is it a sense similar to hearing, where only a few people have perfect pitch and the rest of us can go to hell? J. L. Mackie utter dominates Plantinga. Such a shame these silly people and their silly arguments isn’t drowned in silence. They do not deserve any kind of serious attention. Oh well… at least they provide the author with loads of material. Hey God, my sensus divinitatus doesn’t work! I want a refund! Sorry Ophelia, your warranted belief is only valid with the original sin receipt. You seem to have lost yours. Can you please elaborate re Mackie and Plantinga? Gramatically, if you will. Beauty. These just get better and better. This is the perfect way to mock Plantinga’s bizarre acrobatics aimed at justifying his beloved ancient superstitions. Religion is all about “We’re OK – You’re not OK” , isn’t it? But it works for the believers in child molesting Islam who blow up 100 innocent people at once in the marketplace. Their very act of suicide affirms my veracity. In fact the only reason I am still around is because of them – and also the support I am getting from the oh so enlightened left – such as Sharia banking in UK (at gov. expense) and Canada NDP (leftist) party creating “faith caucus” and demanding law to stop criticism of my Prophet Muhammed and my final, immutable, and universal religion Islam. Oh BTW, Rowan Williams, the left’s darling pomo chaplain now sees the light. Please turn in your broken SD for a new and improved version that includes 1 year free membership to the Respect/Hizb-ul-Tahrir party. Marx did not have an “SD moment” but was in fact quite materialist when he made his comment on Religion beeing the opiate of the people. Marx argument is: “criticism of religion is the premise of all criticism” because “the abolition of religion as the illusory happiness of the people is required for their real happiness”. I think Ophelia Benson just tried to be funny… which is the point of this website… in saying that “SD” does not exist but is merely an invention of catholic propaganda, otherwise there would not be nonbelievers. Judging from her blog she is well aware of the threat by religious fundamentalism. So please spare your aggressive energy for our real foe. I think Sensus Divinitatis is more like my mother-in-law’s deaf ear. When it suited her she was deaf in the ear that was nearest to you, but if you said anything she didn’t like the hearing was magically restored. The deaf ear seem to switch over time too. Hamidreza was just joining in the joke, Mel. And I wasn’t trying to be funny, I was being funny! Mel, heh the clueless postcolonial postmodern Left then must have skipped Marx’ texts in their Cultural and Gender Studies classes. 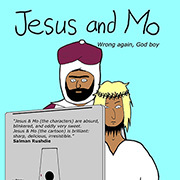 The pomo Left condemns and prohibits any criticsm of “perfect” Islam or its child molesting Prophet Mohammed (Peace Be Upon this Child Molester). When you figure out the reason behind the clueless Left’s affinity for Islam (Michel Foucault and Edward Said’s love of Khomeini, William’s praise of Shariah, Juan Cole’s praise of al-Sadr and Sufi obfuscationism and anti-enlightenment, Socialist Workers Party’s Respect project), when you figure this out, you will understand who the real foe is, and how much stronger he really is. Hamidreza, you tend to paint everyone in a particular religious belief with one brush. Islam is like any religion: It has its fundamentalists and its liberals. Although, I would certainly admit that fundamentalist Islam is far more insecure, physically and psychologically dangerous than Christian fundamentalism. All fundamentalism, however, religious or otherwise, is psychologically dangerous, even fundamental broad-brush painting. Hobbes – “Islam is like any other religion” – No – Islam is absolutist, perfect, universal, and immutable. Koran is taken literally and is the perfect word of god. Never reformed. 1,400 years of reform attempts have failed, some with violence. It is not factual to compare this to most other religions. Where have I painted all Muslims with the same paint brush? Where did I even use the world “Muslim”? I am talking about Islam as a dogma, and Prophet Mohammad (Peace be Upon this Assassin) as a historic figure (and thus not protected against libel). I think you are irrationally generalizing that any criticism of Islam is an attack on each and every Muslim – even if the Muslim agrees with the criticism! heh – since when ideas could not be criticized? I think you are the one who is insulting 1.3 billion Muslims by saying anything wrong with Islam, such as institutional and doctrinaire misogyny, is a reflection on each Muslim’s character, and therefore we should not criticize Islam. As an ex-Muslim with lots of Muslim friends I find that racist. Please do not paint Muslims by your broad paint-brush of prejudice. I suppose this is perspective, Hamidreza. From my own acquaintance with a Muslim friend in college, I found him and his family quite liberal. On the other hand, I see radical fundamentalist Muslims with a love for killing. Logically, there are every level of belief and interpretation in between. Just like any other religion, there are fundamentalists and liberals. And, I didn’t say there was anything wrong with Islam, any more than with any other religion. I’ve no idea where you get prejudice from that. Reviewing your posts, I see I must have interpreted incorrectly. You are not besmirching all Muslims, just Islam’s founder, Muhammad. That’s Ok. YouÃ¢â‚¬â„¢re probably right about that. However, it should be noted that the political spectrum is just as diversified as religion, from radical right to radical left. I lean left, but that does not mean that I can be painted as a radical leftist. I also agree with some ideas from the right. Argumentum ad analogum (fallacy through analogy). Apples are green, yellow, and red. So are grapes. Therefore oranges too. There is a sea difference between Islam, and Christianity or Judaism in that Islam has successfully and violently battled reformation and has been victorious. Pls. read about Islam by its critics, e.g. faithfreedom.org, and not by the Islamic Studies class taught by an Imam specializing in rhetoric in your college. The prejudice stems from the fact that you think criticism of Islam is expressing hatred against each and every Muslim. If I attack an unsavory act or tenet of Islam, you generalize that to being an attack on all Muslims, because you believe all Muslims commit such unsavory act or believe in such unsavory tenet – and therefore such criticism also applies to all Muslims. I think I once explained that the socio-politico-economico-philosophico spectrum is not a simplistic one-dimensional left-to-right axis. I have identified at least 5 significant axis. Homework for you: Identify the 5 axis – by which the left-to-right is an averaging reduction. Ophelia is even funnier than she (presumably, she) appears. My kind of ELR. the tire casings, and the other dead appliances. And why did you break up? Philosophical disagreements I bet. Hamidreza, you missed my point. I can’t believe you were Muslim and don’t see what I’m saying. EVERY religion has its spectrum of believers. If your argument were correct, every Muslim is as radical as the worst. Of course there are a lot of differences between Islam and Christianity. Structurally, they are quite the same (radical to liberal). I’ve seen that myself. Hobbes, again you are generalizing without attention to the complexities. Lets put it this way. Chritianity has a spectrum from red to violet. Islam has a spectrum from blue to violet. They are both spectrums, but Islam is right to ultra-right wing (since you are so fond of left-to-right stuff). Most Muslims are radical in thought. Except for the westernized Muslims (which you Postcolonial Leftists like to call the unauthentic self-hating “Uncle Toms”), the rest of Muslims believe in the infalliability and absolutism of the Koran and Prophet Mohammad (Peace be upon this Assassin). Now few of Muslims act on their radical thoughts – (which is good.) That is why the activist Muslims or Islamists can commit severe acts of illiberalism (such as misogyny) and terrorism, and they are never condemned by the majority of Muslims. Funny thing is why the supposedly tolerant cultural Leftists accept such hatred, intolerance, discrimination and oppression of Muslims (and infidels) by Muslims. I have never seen a poco/pomo Leftist criticize Islamic nonsense or its criminal Prophet – and therefore it is fair to say that Leftists support intolerance, misogyny and oppression by Muslims. The unexamined belief is not worth accepting. If you examine a theory and accept it, you are not believing in it – you are accepting it. If you accept it without examination, then you are believing it. What does “re” mean? And you want me to elaborate “gramatically”… what? Gramatically correct, perhaps? J. L. Mackie was an australian philosopher (yada yada, go check wikipedia) who wrote the book “The Miracle of Theism” in which he, with sublime logic, criticize all the classical arguments for God’s existence and some new ones (even a Kierkegaardian standpoint). I highly recommend it and his “Ethics: Inventing right and wrong”. Mackie was surely a superior logician, compared to Plantinga. What’s all this about senseless divinitatis? Do I have that raft thing if I become buddhist? Just for the record, pace Gjerstad, Mackie doesn’t discuss Plantinga’s reformed epistemology at all. 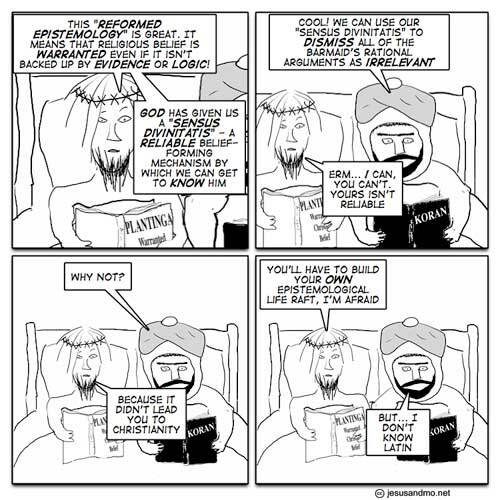 This one is my favorite ..
Hamidreza’s bragging defense of Islam as an immutable and perfect word of god is hilariously arrogant as it is wrong. If you have more than one sect trying applying the rules laid out in a single untranslated original text, then even your own fellow religious can’t agree on interpretation of this being’s wishes. How is this divisiveness not reformation? The sect of Islam that is cool with depicting Mohammed is not the one burning embassies, I’d imagine. “Perfection” is a meaningless attribute for a text, amounting to no more than ad copy for the product. It’s like the vision of the Borg Queen for the universe, entirely subjective, and necessarily controversial. Claims such as these beg to be argued against, by skeptics, against the Hamidrezas of the world; it’s the indoctrinated, brainwashed, cowed followers that have no voice to fight back under threat of death due to apostasy. We need to make the world safe again for critical thinking and freedom of expression. Time to get the Federation to fight the Borg of religious monopoly on an individual’s rights to think differently and question.